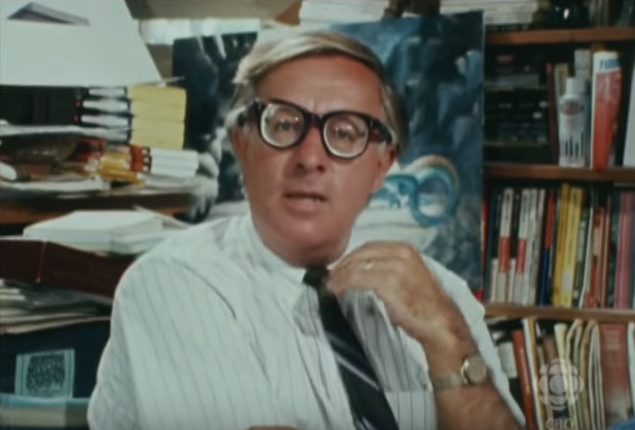 When you think of the most astute minds of our time, you might well think of Ray Bradbury's — but you probably don't think of him as one of the most astute terrorist minds of our time. The Federal Bureau of Investigation, however, saw things differently. Collaborative news site MuckRock found that out through files "released to former MuckRocker Inkoo Kang [which] document the decade the Bureau spent trying to determine if Bradbury was, if not a card-carrying Communist, at least a sympathetic 'fellow traveler.'" See snippets of documents here from 1959. You can view the files themselves, obtained under the Freedom of Information Act, at MuckRock. There, the site's JPat Brown also summarizes the organization's basis for suspicion against the author: his "membership in the Screen Writer's Guild, as well as his vocal opposition to McCarthyism, drew particular attention," as did the use in The Martian Chronicles of the "repeated theme that earthmen are despoilers and not developers." 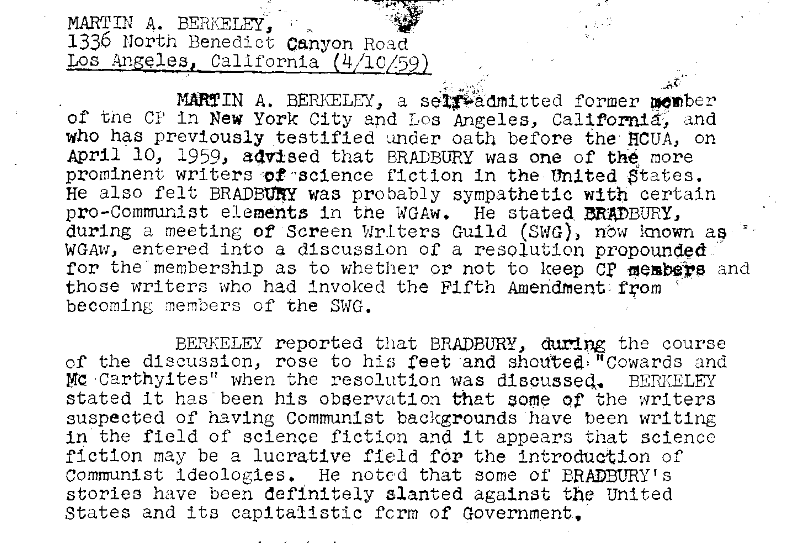 Not just Bradbury's work but the whole of science fiction, which informant Martin Berkeley calls a possibly "lucrative field for the introduction of Communist ideology," comes in for an indictment. "Communists have found fertile opportunities for development," Berkeley says, "for spreading distrust and lack of confidence in America [sic] institutions in the area of Science Fiction writing." Another, unsurprisingly clearer view of the genre comes from Bradbury himself, quoted disapprovingly in the file from a 1959 Women's Legislative Action Bulletin. There, he said he uses the medium of science fiction to "try to bring to light some of the current fallacies in human values today" — the one thing, as the author of Fahrenheit 451 must have known full well, that the powers that be least want anybody to do. Get more at MuckRock. It’s obvious he was a commie—Martians are RED, right? The Paranoid States of America. Check the early star trek series. They are full of innuendo references to communism. Brilliant propaganda light years ahead of anything.